The brain is a pattern-seeking device. A routine is a pattern for how to conduct a certain activity. The more consistent and clearly represented your routines are, the more safely, smoothly and cooperatively your school will run. 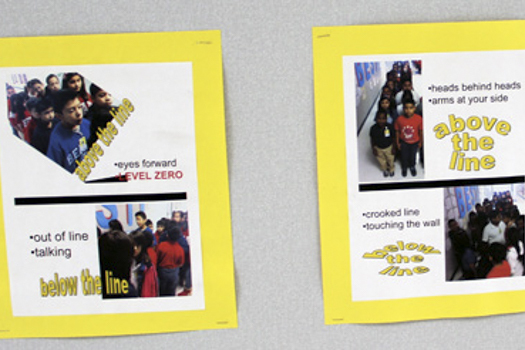 Post visual representations of your routines for safe, helpful school behavior throughout the hallways. Routines to post in the hallways include procedures for lining up and walking, what to do while you are waiting to enter a room, school assembly entry/dismissal procedures (in the hall outside the assembly space), cafeteria procedures (in the hall outside the cafeteria), bus arrival/dismissal procedures (near the bus line), car lane arrival/dismissal procedures (near the car line) and pedestrian arrival/dismissal procedures (near the pedestrian walkways). The Creating the School Family book devotes an entire chapter to creating routines, posting them visually and supporting them with related activities. The NEW Conscious Discipline Updated & Expanded book also explores routines in-depth. Music that supports daily routines includes “Skip Count” and “I Gotta Go” on Brain Boogie Boosters.